Do you hear it? Sputtering and coughing? Scraping and jangling like some demented skeleton in your vents? It’s not a paranormal issue, it’s your heater giving off its death rattle. Coincidentally, your heater’s corpse is much easier to deal with than a real one, what we don’t recommend however is looking up “DIY heating” solutions with your smartphone to puzzle out the next best thing to a heating replacement. You’re likely to stumble upon a couple of articles that claim that you can heat your house by propping the oven door open. Luckily Valiant Air is here to help you steer clear of quick fixes that are more likely to raise your energy bill and start your house on fire than they are to warm you in those harsh Centennial winters. Here are a few of our favorite heating mistakes that you should definitely side-step and just invest in a heater replacement unit. Trust us, it’s worth it. While it’s true that we have access to some pretty high tech temperature control devices, their effects are not instantaneous. It would be nice if they were, but apparently, we’re getting automated cars before we’re getting uber powerful heating and cooling systems that drop or raise the temperature by entire degrees in seconds. Until that time comes when we are granted these ultra-powerful machines from the tech lords, we’ll have to start navigating your thermostat in an intelligent fashion. Turns out you might be bringing that death rattle you hear emanating from the depths of your ventilation system sooner rather than later, if you’re abusing the control panel for your heater. Mainly, trying to heat or cool your home what you probably call “faster” won’t do much in the way of making you heater last longer. 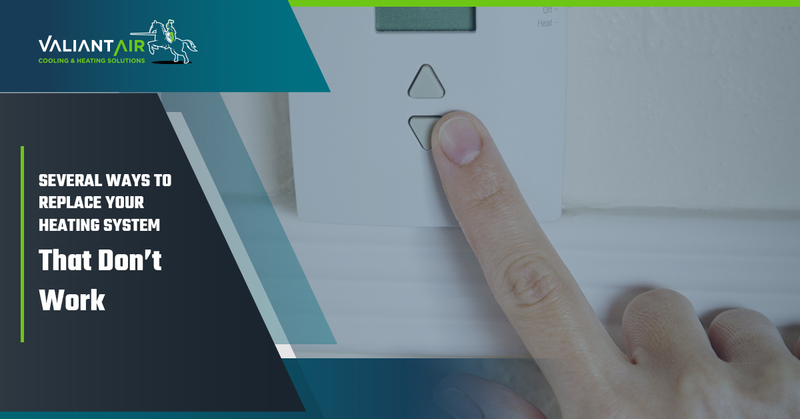 If your home is hovering around 60 degrees and you like it at 75 degrees, don’t attempt to get it to move to that temperature faster by setting the thermostat at 80 degrees. It’s just going to make the heater work extra hard to get up there and then you’ll have to adjust again because you’re too hot. Don’t fuss with your heater anymore. Just call the professionals. Don’t resort to taking hot showers to keep warm or lighting tons of candles to create the illusion of a fireplace, just call it good and invest in a heater replacement. When you contact Valiant Air, we’ll come to check out your heater and your indoor air quality and offer an analysis that is in your best interest. If you can afford a heating repair right now rather than a replacement, we’ll do our best to make that happen instead of forcing you to invest more than you have available. Make your appointment to stay warm this winter now.